Hello there my friends, I hope you all had a great weekend and have settled in with the time change. This weekend was busy but productive. On Saturday, I participated in the ‘Light the Night Walk’ for leukemia and lymphoma with family and friends, and it was such a success. It was wonderful to see so many people participating. Although my heart was heavy, I felt so empowered by the guest speakers. On Sunday, I ran errands, organized and prepped things for the week ahead. 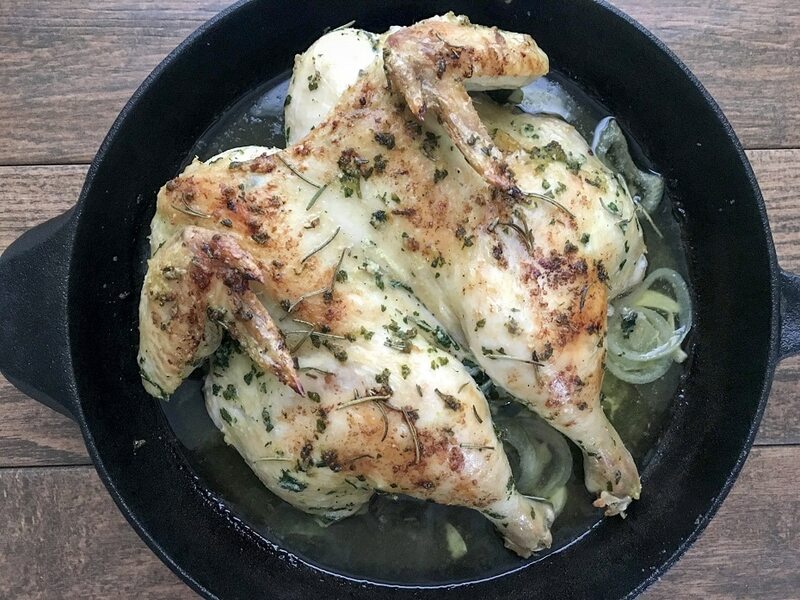 Okay, so I’m pretty excited to share my Oven Roasted Butterflied Chicken recipe. This recipe is so easy, and you wouldn’t believe how easy it is to butterfly a chicken. Yes, it is so easy. Yep, that’s it. I sat the now butterflied chicken aside and began chopping my veggies and herbs. 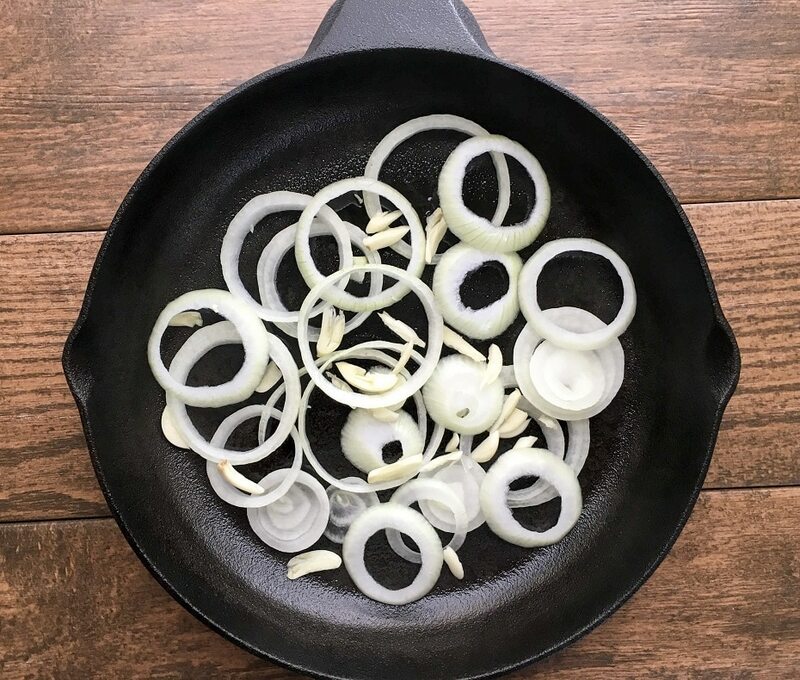 I created a single layer of onions and garlic in my lovely cast iron skillet. In the past, I’ve layered with carrots and celery which is great as well, but I do not have any on hand. So, I used the veggies and herbs that are a staple in my home. This will add some much flavor to your meat’s juices. 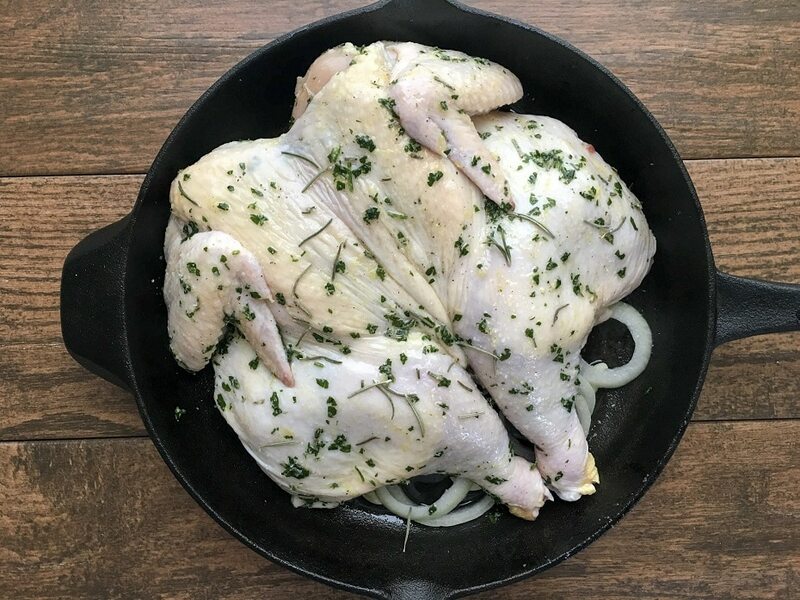 I then seasoned both sides of the chicken with the herb and olive oil mixture that I prepared and then placed the butterflied chicken breast side up on top of the bed of onions and garlic. As a side note, I’ve used butter instead of olive oil on other occasions but as a healthier option I prefer olive oil. I think Oven Roasted Butterflied Chicken is so versatile. 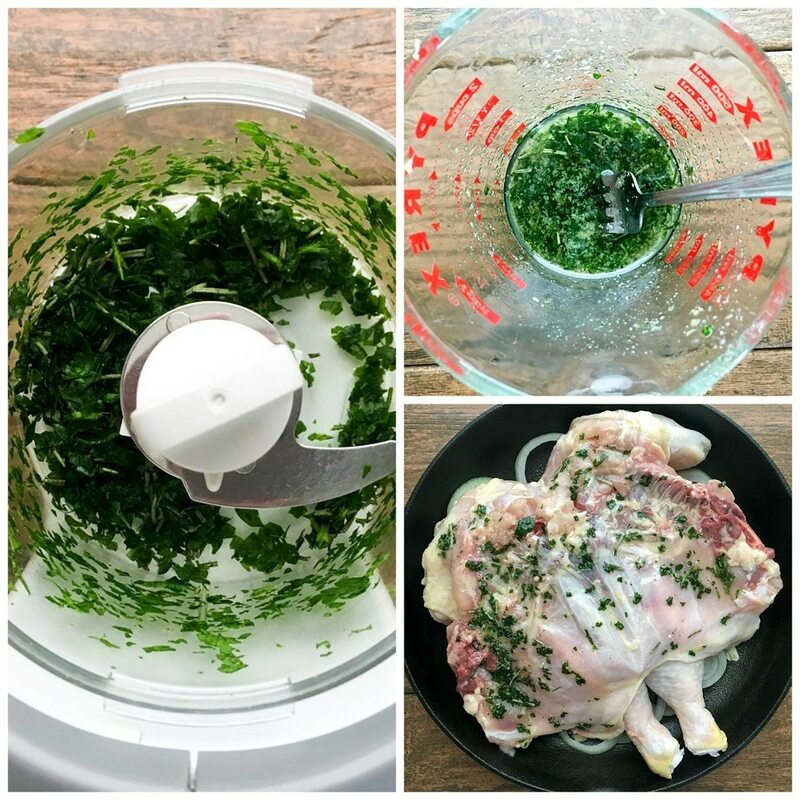 You can use an array of different herbs and will still come out with a beautiful tasty oven roasted chicken. I didn’t want to forget to mention that the splash of fresh lemon juice enhances the flavor of this Oven Roasted Butterflied Chicken. This recipe is easy, low maintenance, and ready in about 1 hr and 15 minutes. 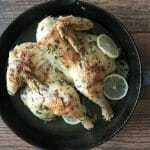 Delicious Oven Roasted Butterflied Chicken made with parsley, rosemary, olive oil, lemon zest, salt & pepper. Wow!! 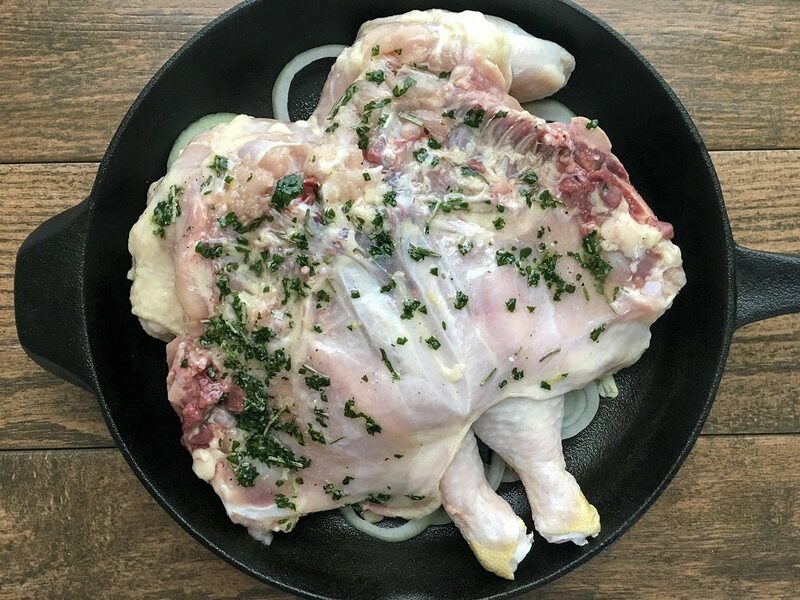 Place butterfly chicken on top of bed of onions with breast side up and sprinkle reserved salt and rosemary over the top of the chicken breast. Roast for approximately 1 hr 15 mins. 45 minutes after chicken has roasted in oven, add a splash of lemon juice and baste chicken with juices in skillet. Baste chicken twice. In my opinion, a little bit of rosemary goes a long way.